Sea purslane is a British sea vegetable. It has pink, star-shaped flowers, but it's the edible leaves which are most commonly collected by foragers, and used for cooking. They're matt green, with a plump, fleshy texture, and a sea-salt taste. The creeping plant grows on sand banks and in wet marshland areas, and is sometimes used to stabilise sand dunes to prevent erosion. Sea purslane is most often found on the south coast of England, but can creep along the Scottish coast line too, if it's a warm summer. Sea purslane is a crammed with vitamins and minerals. In the Caribbean, it is even used to treat puncture wounds from venomous fish - the sea purslane is pounded into a paste and slathered over the injury. Sea purslane comes into season in summer - round the same time as samphire, wood sorrel and elderflower. As it is such a seasonal vegetable, it may appear at a coastal farmer's market one week, but be gone by the following week. To track it down, also try online food specialist shops, foragers and well-connected fishmongers, between late June and September. Sea purslane is at its saltiest when eaten raw. In fact, it's so salty, raw sea purslane shouldn't be served in any great quantity - just used as a garnish. Blanching or steaming sea purslane gets rid of some of the salty flavours. It only needs a short amount of cooking though. Boiling or steaming it for too long will drain sea purslane of its nutrients, as well as turning the leaves dark green, and making them taste unpleasantly bitter. When it comes to serving sea purslane, it's best not to overwhelm it with too many other flavours. A simple pinch of black pepper, a squeeze of lemon or knob of butter showcases it perfectly. There is no need to add any extra salt at any point during the cooking process, as sea purslane is already salty enough. 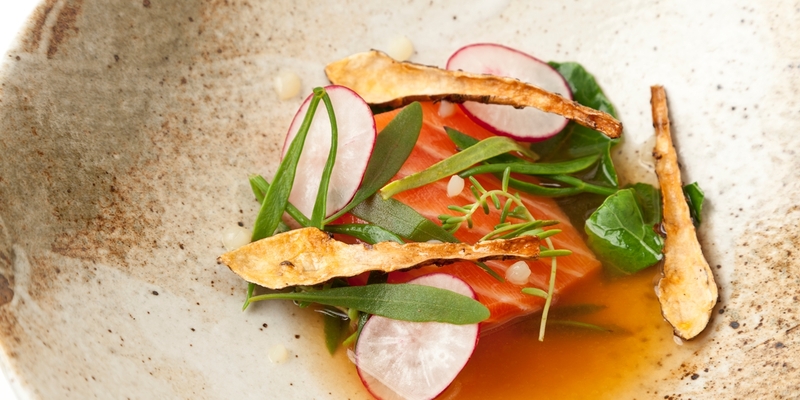 Sea purslane makes a natural partner for fish - thanks to its sea salt flavour. It's a versatile vegetable though. As its main characteristics are greeness and saltiness, sea purslane also works well alongside anything from lamb to veal. Pairing sea purslane with green herbs, like sage, is a good way of highlighting its juicy, vegetal flavours, and it also works well when turned into a kind of coastal pesto.